Why pay good money to see a show when you can take center stage in your own? 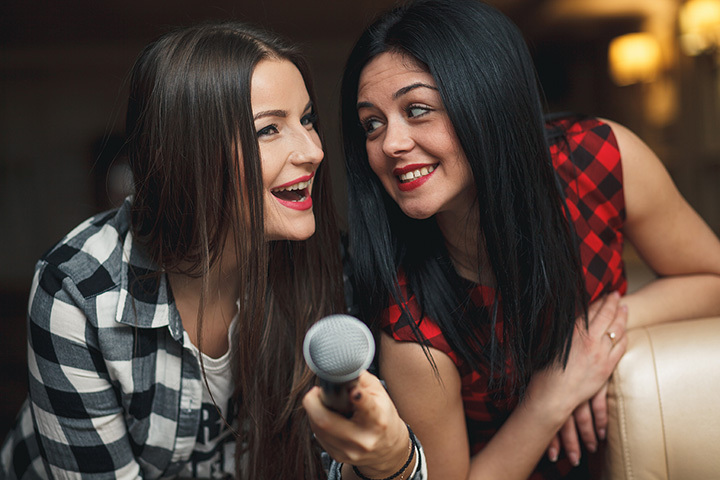 Karaoke bars are a great way to have fun on a budget, and may even help you tap into talent you never knew you had. The mic’s on at these 10 best karaoke bars in South Carolina—get ready to sing your heart out. Nestled in Celebrity Square at Broadway at the Beach, locals and tourists alike know that Broadway Louie’s is THE competitive karaoke destination on the Grand Strand. Their award-winning karaoke features a prominent stage on which you can channel your inner rock star and get the party pumped—and maybe even win some cash! Some call it a mecca for nightlife entertainment, others call it their home away from home. Either way, Upper Deck Tavern is certainly doing something right. Their bartenders are on point, the atmosphere is fun and enjoyable, and you can get in a few rounds of karaoke in one of the friendliest environments in the Holy City. As Columbia’s first true karaoke bar, you’ll find a singing experience unlike any other. Their karaoke lounge is quality, to say the least, plus you’ll find songs in a variety of languages, such as Spanish, Korean, Chinese, and Tagalog. Their food and drink menu sings a sweet tune in case singing just isn’t your thing. This isn’t your average karaoke bar. For starters, you may find yourself coming here strictly for food when karaoke isn’t in session. In addition, you can expect other events, such as trivia and live music, to share the karaoke spotlight. The karaoke machine is spinning on Mondays, Wednesdays and Saturdays for you belt out your favorite songs. Patty’s has built quite a local following, and for good reason: you can expect the same friendly service and quality food and drinks every time you visit. Aside from the karaoke, you can break out your dancing shoes and enjoy non-karaoke music on select nights. If you’ve never been a stellar singer, it won’t matter here. Savannah Break uses a live version of Auto Tune to help you sound better (your peers will thank them for it). They also keep their music library fresh and current so you’re not stuck hearing 50 renditions of “I Will Survive” every time you go. It’s not an official karaoke bar, but it’s certainly the best spot for karaoke in this small college town. Here you can enjoy the sounds of your best friends belting out their favorite tunes while you chow down on some of the most delicious cuisine in Uptown Greenwood. Howard’s also features live bands, trivia, and other events throughout the year. It’s everything a hometown bar should be. Their prices are fair, the food tastes good, and the people are friendly. People love Libby’s because of its warm, inviting atmosphere that makes you feel like part of the family. If you want a genuine karaoke bar experience, this is it. A prominent locale in the LGBT community, you can catch the karaoke showdown every Wednesday starting at 10 p.m. Singers compete for a chance to win cash prizes (and bragging rights), so make sure you warm your vocal cords before you take the stage.